Road warriors of this day and age have a routine that they tend to keep to – and to miss it in a single day could prove disastrous for the next. I am referring to plugging in your plethora of gadgets at night before you retire, so that by the time you wake up refreshed and ready to greet the new day with a slew of challenges lined up, at least your gizmos would also be prepared and ready to tackle the same issues head on. Well, there are times when forgetfulness strikes, or out of plain tiredness, you fail to juice up your smartphone or tablet. 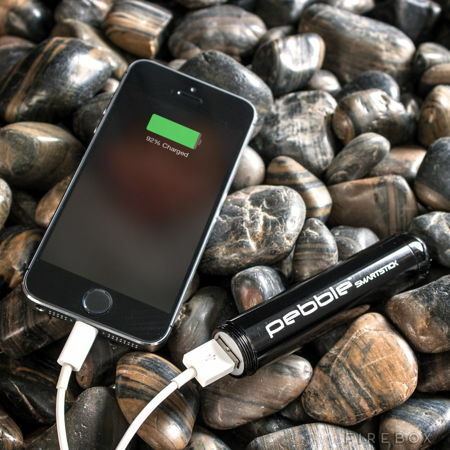 Fret not, there is always a solution to every problem, and in this case for portable pocket power, the £29.99 Pebble Smartstick + Portable Charger would be equal to the task. Sporting a 2,800mAh power supply, it will not only be able to juice up your smartphone to the maximum, it should also have some more juice to spare. The Pebble Smartstick + Portable Charger would arrive with a handy carabiner as well as a protective screw cap, allowing you to hook it to a bag or belt loop, while making sure that the connector remains safe and sound from any external damage. After all, the entire device arrives in a sturdy metal casing, where there will also be red and blue LED charging indicators to let you know of its status. 5 charging tips have been thrown into the mix, including micro-USB, mini-USB, Sony Ericsson, Nokia pin tip and Apple 30 pin.